As one of Asia’s leading financial centres, Hong Kong is not only a great place to do business, it is also a gateway to the region. Hong Kong is a modern financial hub at the cutting edge of world finance. Its economy differs from the rest of China, as a result of the country’s “two systems, one country” policy that was introduced during the 1997 handover. Under this policy, Hong Kong is not subject to the same policies that govern the rest of China, except when it comes to military and defensive matters, allowing it to be one of the most free economies in the world and a great place to do business. Hong Kong has an open economy, being rated as the freest in the world by the Index of Economic Freedom for 20 consecutive years.2 A shared history has also given Hong Kong a familiar feel for British companies. It has a similar legal system to the UK, and has especially good legal protection when it comes to intellectual property rights. The region is heavily urbanised, and considered both a megacity and one of China’s economic hubs. It’s situated around the Pearl River Estuary, which may be helpful for businesses looking to transport goods via the South China Sea. It is a good place to do business financially, with a well regulated banking system and the second largest private equity centre in Asia. Hong Kong’s stock market is the second largest in Asia and the sixth largest in the world. Hong Kong has a free trade agreement with Europe, the European Free Trade Agreement, which reduces red tape when it comes to exporting to the region. There are few major challenges for British businesspeople looking to trade with Hong Kong. English is one of its official languages, and the World Bank rates it as the second easiest place in the world to do business.3 In fact, on each of the levels measured, Hong Kong only fell out of the top ten worldwide for ease of registering property, and resolving insolvency. There are issues within the market caused by rapid urbanisation, alongside air and water pollution. However, these have the possibility to create opportunities if you are in the right industry. Time zones and distance from the market represent a challenge, of course, but this is not unique to Hong Kong. 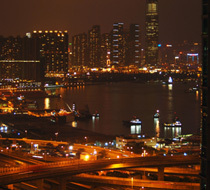 Hong Kong acts as a gateway for goods and capital, both into Asia and out of China. There are a number of opportunities for British businesses in the region. It is highly dependent on international trade and finance, and also has a big market in re-exportation of goods. This is because Hong Kong has no import taxes, and has export taxes on just four different types of product: hard alcohol, tobacco, hydrocarbon oil, and methyl alcohol. It has limited natural resources, meaning that foodstuffs and raw materials must be imported. UKTI has identified several high value opportunities (HVOs) for British businesses in Hong Kong, which are worth in excess of £5 billion per year. It is important to remember that HVOs are not just for large companies – there are a myriad of opportunities within each one for smaller companies to benefit. You can learn more about HVOs, and how companies of all sizes benefit from them, on page 16. The population of Hong Kong is rapidly aging, and as such there are opportunities for British companies in healthcare. It is hoped, in addition, that research collaboration between the UK, Hong Kong and Mainland China will create future opportunities. Right now there are construction opportunities for the building of new hospitals and the reconstruction of existing ones. There’s also scope to promote UK healthcare and construction expertise in Hong Kong with the aim of winning business in the Pearl River Delta region of Mainland China. West Kowloon Cultural District is an ambitious cultural project covering 40 hectares. It’s one of the largest projects of its type in the world and will comprise of, among other things, concert halls, theatres, green spaces and a museum of visual culture. There are numerous opportunities for UK businesses of all kinds, including audio visual technologies, design and installation of entertainment facilities, management and operation of world class multi-use stadia and venues, and, of course, artistic and cultural content. Other HVOs include projects in transport development, the Kai Tak urban regeneration and development project, and tackling environmental issues. You will need to visit Hong Kong to establish a relationship with the person that you’re going to be doing business with as a great deal of weight is put on personal relationships. The economy of Hong Kong is distinct from the economy of China. It has a separate currency, legal system and system of taxation. The economies are close, however, especially since the introduction of the Closer Economic Partnership Association (CEPA). CEPA aims to bring regulations in both areas closer together so that it is easier than ever for Hong Kong to do business with China and vice versa. This makes Hong Kong a great base for businesses who would like to trade with the rest of China. Appointments must be made in advance. Hong Kong business generally operates Monday to Friday from 9 to 5. Try to avoid doing business at Christmas, New Year, Chinese New Year and Easter. The best times to do business are October, November and from March to June. Negotiations are often slow, which can be frustrating. If you are looking to speed up the process, rather than trying to put pressure on the negotiations, adding more detail may help. A deal will require a lot of face to face meetings. Negotiating is usually done by lower level employees and, while a senior executive may be present at meetings, it may well be in more of a supervisory capacity. Hong Kong Chinese have a different idea of personal space than we have in the UK, partly due to culture and urban density. When conducting business they may stand very close to each other. It is a mistake, however, to confuse that closeness for familiarity – like Britons, Hong Kong Chinese typically don’t like to be touched and winking is considered a rude gesture. Never point with your index finger, as this is reserved only for animals. Instead, gesture with your hand open. Be modest in your dress, body language and words. Aggressiveness and confrontation are not seen as good characteristics to have in people who you do business with. Try not to use the word no; instead use phrases such as ‘I will try’ and ‘That will be difficult’. Similarly, if a Hong Kong Chinese person says ‘yes’ it can sometimes mean merely ‘I hear you’ or ‘I understand’. Your business cards should have English on one side of the card and Chinese on the other. It is important to use classical characters rather than the simplified characters of the People’s Republic of China. Business cards are presented with both hands, Chinese side up, on introduction. Always look at a card that you have been presented and comment upon it. Hong Kong is a hierarchical society, and it is important to recognise the senior members of a delegation and greet them first. Giving and receiving gifts is an important part of doing business in Hong Kong, both on first meeting and at Christmas and New Year. Gifts are given with two hands and are not unwrapped in front of the giver. Gifts to avoid are clocks, books, blankets and green hats. The business style is typically efficient. Punctuality is well respected and it’s best to be on time but, if your business partner is late, it is customary to give 30 minutes ‘courtesy time’. Tea is served at meetings, and you should wait until your host takes a sip of their tea before beginning to drink yours. Any slowness in negotiations is largely because deals tend to be discussed in a lot of detail. When choosing people for a delegation, it is best to send executives that are able to make significant decisions on the spot. Lawyers are not included in meetings until the contract stage. Succeeding in Hong Kong can be complex – the mesh of British and Chinese business culture has created a unique environment. However, British firms have a head-start on companies from mainland Europe in terms of culture, language, and legal systems. Moreover, the ease of doing business in Hong Kong and its continued growth make it a highly attractive market.